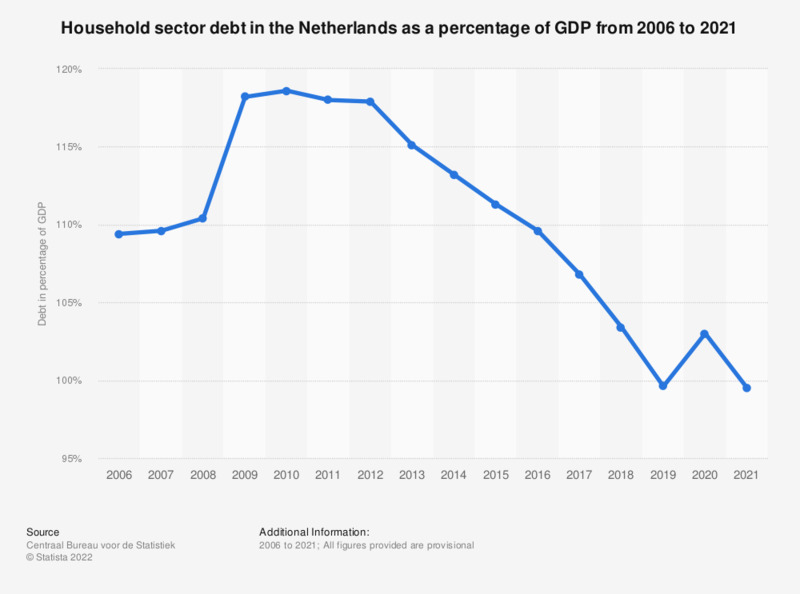 This statistic shows the household sector debt in the Netherlands as a percentage of Dutch GDP from 2007 to 2017. In 2017, the total debt of the household sector equaled 105.1 percent of GDP. This is a decrease when compared to the previous year. The source adds the following information: the household sector debt includes the total debt of households and non-profit institutions. The debts include only loans, and are consolidated, i.e. debts within the same sector are not included. A high debt increases the vulnerability of the households to changes in economic conditions, interest rates or inflation. Part of the outstanding debt must be refinanced periodically. Rising interest rates may lead to higher periodic interest payments for borrowers. A deteriorating economic situation may persuade banks to tighten their conditions with respect to collateral. As a result households may receive lower mortgage loans with potential implications for the developments on the housing market and in the construction sector. The European Commission has set an upper limit for total private sector debt (including non-financial corporations): +133 per cent. * All figures provided are provisional.